Get ready for a wild time, country fans!! Country’s favorite duo are BACK, with an ALL-NEW ALBUM – that’s right, Florida Georgia Line hit the road in 2019 with their “Can’t Say We Ain’t Country,” tour! They’ll be joined on the road by special guests Dan and Shay, as well as Morgan Wallen – it’s going to be incredible!! It’s all happening at the BB&T Pavilion on Saturday 13th July 2019 – make sure you’re there! Tickets on sale NOW and expected to sell out FAST! For nearly two decades, Tyler Hubbard and Brian Kelley have been pioneering the “bro-country” genre – feel-good music about the simple pleasures in life, often musical borrowing elements from other popular genres including rock and rap. As a result, they’ve been incredibly popular among young people, and their live shows have gained a reputation for being some of the most fun country concerts that money can buy!! We can hardly wait – what about you?? 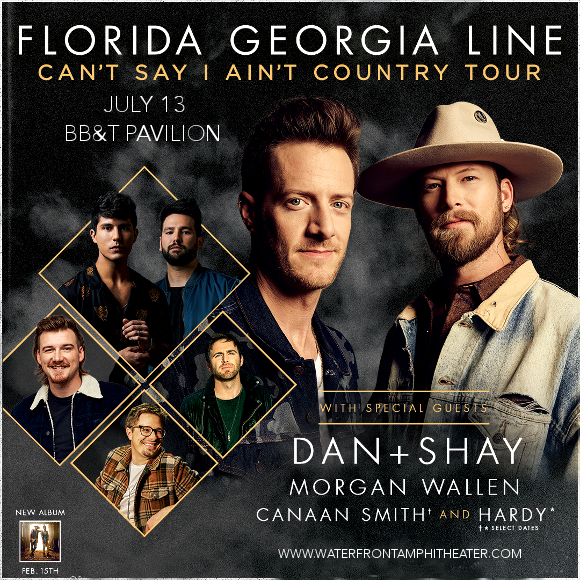 There’s not a moment to loose – hit the “Buy Tickets,” button and get your pass to see Florida Georgia Line, Dan and Shay, and Morgan Wallen NOW while stocks last! !